A body part of a saint, sacrificed by the Healing Church in their search for Truth. 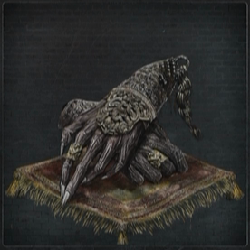 Sage's Wrist is a consumable material Item in Bloodborne. Two are used in the creation of a Central Pthumeru Root Chalice dungeon as a Fetid Offering. It is also used in many other chalice rituals for implementing the Fetid rite. Randomly found in the gold sarcophagus caskets within the Central (and deeper) Pthumeru Chalice dungeons. Can be dropped by the fast running, long haired enemies in Hintertomb and Loran chalice dungeons. Can be bought in NG+ for 1 Insight at the Insight Messenger Shop in the Hunter's Dream. Why is this the only one that says "special material used in a holy chalise ritual?"